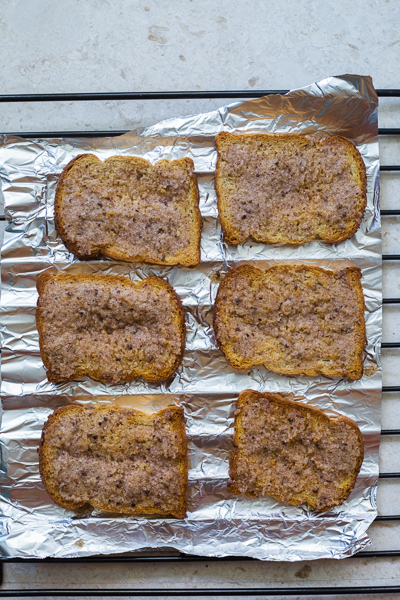 Cinnamon toast—just your everyday bread slathered with butter, cinnamon, and sugar and baked until crunchy, golden, and downright delicious. 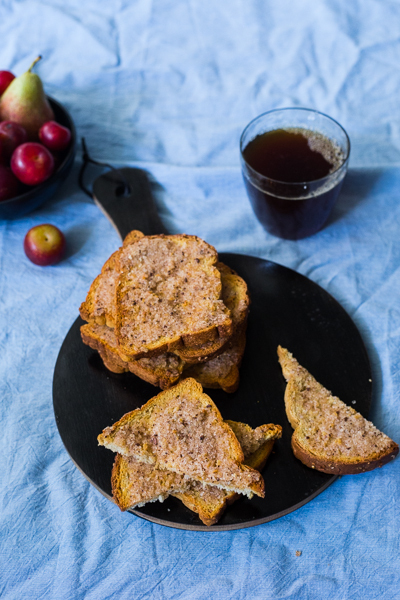 Since these toasts can be made in bulk, and in advance, they make for a really good breakfast option, an evening snack with coffee or tea, or for just about any time of the day, really. 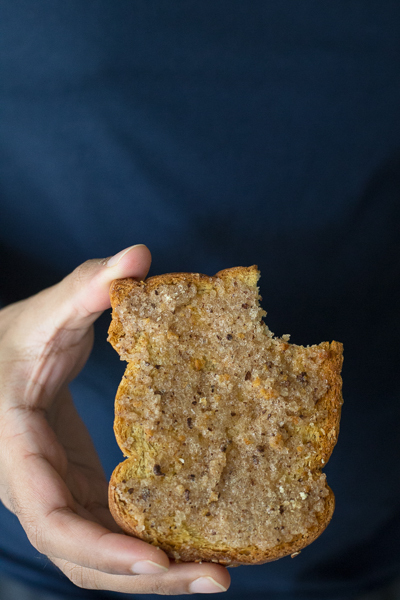 They are ridiculously simple to throw together, taste like you slaved over them, and are actually not as bad a snacking option in my opinion (especially so when you use whole wheat bread.) Also, they go quick, so be sure to make extra. When it comes to recipes with so few ingredients, it helps to make that little extra effort to maximize flavour—in this case it’s blending up a cinnamon stick in place of store-bought ground cinnamon. That’s pretty much all the ‘extra effort’ I’m talking about. The crunch is a crucial part of the result we’re after so this is important: after the toasts are cooked and golden brown, they will feel slightly soggy. This is completely normal. Don’t stress. Leave the tray out for about five minutes, by which time they will have hardened slightly and gotten super crunchy. Counter-intuitive I know, and I’m not entirely sure about the reasoning behind this but that’s just how it seems to work. Some recipes that use bread as their base—like a bread and butter pudding or even french toast—taste best when you substitute white bread for whole wheat. It’s hard to be virtuous and not compromise on flavour at the same time. Not the case here – I actually prefer the nuttiness of whole wheat to white (I tried it, to make sure.) Also, if you’re someone that doesn’t like crusts on bread and have the habit of lopping them off, please do not. The crusts get really crunchy once baked and rested, and these are actually my favourite bits. The fighting-for-it bits. 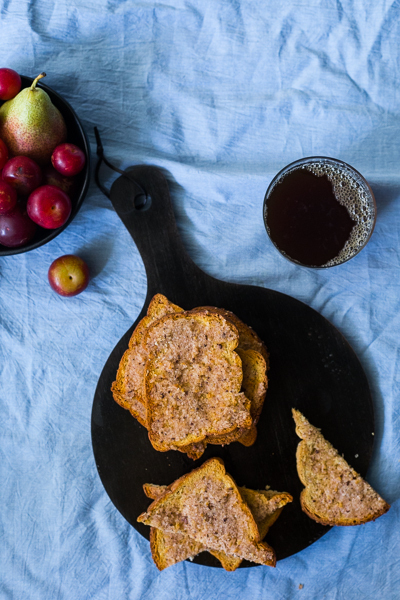 For something that can be made with just your everyday pantry staples, these toasts sure have a lot going for them. Preheat oven to 160 C (320 F) and line a baking tray with aluminium foil. Blitz the cinnamon stick in a blender until it’s an almost fine powder; it’s completely fine if there are a few slightly coarser bits. Add butter and sugar and blend for 2-3 more seconds, just until it’s all combined. Slather this sugary cinnamon butter onto each slice of bread and place on the baking tray. Bake for 12-15 minutes until golden. Keep an eye out after 12 minutes and make sure the bread doesn’t burn. Set aside to cool for 5 minutes for them to crisp up. Serve immediately or cool completely and store in an airtight container for up to 2 days.